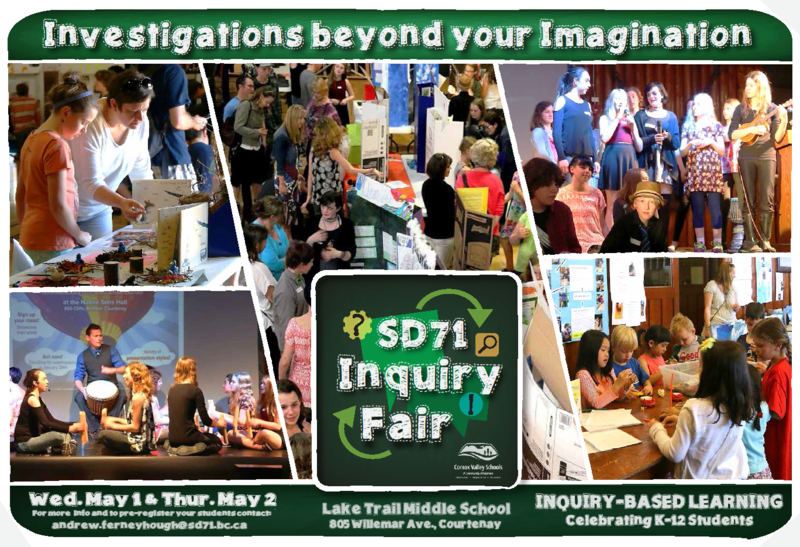 Click here to view some pictures of the 2016 Inquiry Fair. 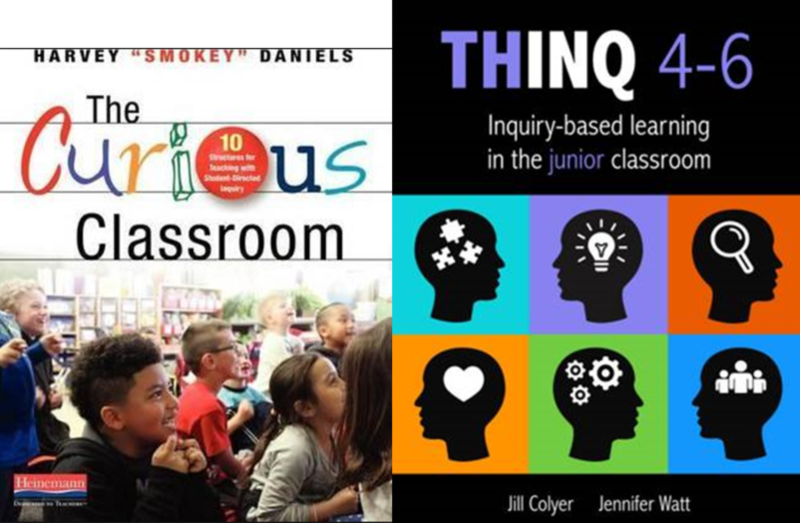 Please scroll down to find links to help you with your inquiry projects. 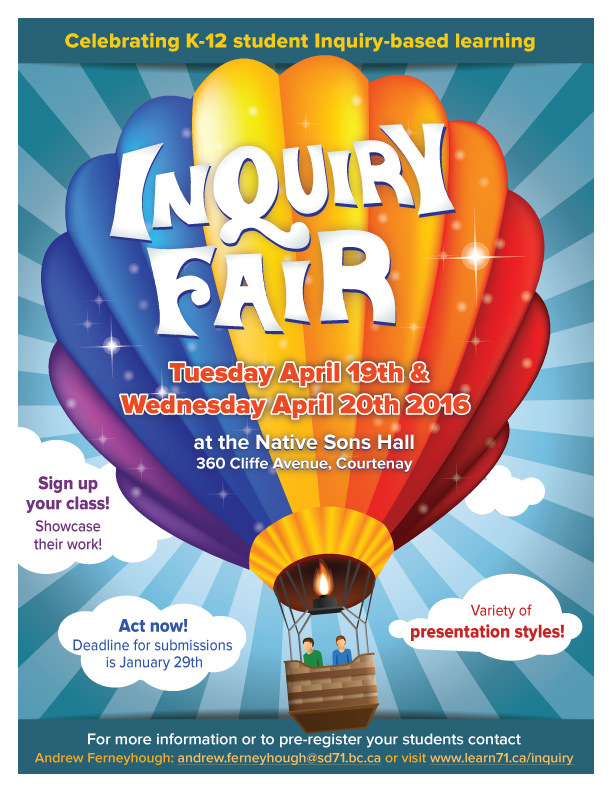 On the evening of Tuesday, April 19th, 10 months of planning came to fruition with the launch of our initial Inquiry Fair, held at the Native Sons Hall. That evening 60 students from schools around the district presented their inquiry projects to interested community members. Projects were as varied as the students who created them, as most were projects following a line of inquiry initiated by the students. The opening was short on speeches and long on student performances and displays. At one point students from our Fine Arts eCademy presented a song created by students at Queneesh Elementary – Compassion is our Passion. On Wednesday another 240 students presented their inquiries during a busy day at the Native Sons Hall. Topics ranged from family lineage to Global Warming, bullying to international collaboration and advocacy. Most presented their projects visually with poster boards and responded to questions from the public; however, some were more creative in their presentation methods including interpretive dance, theatre, hands-on displays, decks of playing cards created to convey information, and group presentations. The youngest to present were two kindergarten classes, one from Puntledge Park Elementary and the other from Valley View Elementary, and the oldest were students from Highland Secondary School. The one thing all projects had in common is that they followed the Inquiry Process. “I was very happy with the success of the day,” said event committee Chair, Andrew Ferneyhough, “we had students from 19 classes representing 9 different schools and all of the students experienced their inquiry work being celebrated.” The organizing committee represented teachers from across the district who use inquiry as an engine to learning in their classes. A display of pictures from the day are available on Learn71 (www.learn71.ca), Learning Together, Inquiry Learning. The Genius Hour is a wonderful way to do Inquiry Projects with your class. This link has pretty much everything that you need to get started. Check out Wonderopolis to get ideas for your class. What do you wonder about?